Alloy Motocross Gear was brilliant for the dirt bike rider. Alloy Motocross Gear is the thing - when you're out jumping ramps on your dirt bike. You need to have the proper amount of protective equipment while remaining comfortable, right? Luckily, Alloy has something for you. While always keeping the comfort of the rider in mind. Alloy has created protective pants, gloves, shirts and helmets for both men and women riders. It's no surprise that the number one name in protective Motocross gear is Alloy Motocross gear. Alloy has no shortage of riding accessories either. For each article of clothing there are a few different series' of protective gear. This means that Alloy has developed a line of protective gear that will fit you and your budget. Their many lines of protective shirts offers a variety of options. Each series of Alloy Motocross gear has a different riding preference in mind. The lower end Alloy Reactor racing jersey is about thirty dollars, and provides light padding & 100% breathable material. The higher end Alloy Fuel jersey offers everything the Reactor series has plus a few extras. The Fuel racing jersey, however, will set you back about ten dollars more than the reactor. Look and feel like a Pro! Alloy makes Motocross gear with the professional rider in mind, trying to develop new accessories to make outstanding riders even better. The Alloy Clutch series of racing gloves are thin, but provide light protection and provides a "one on one" grip with the throttle. The Clutch series is both light and affordable, setting you back only about twenty-five dollars. The Atom glove is another glove by Alloy that offers thicker, heavier protection. While not providing a grip as personal as the Clutch, the Atom still delivers a thin, "no-set" grip to give you the control you need. This model glove will cost you a bit more in the end, about thirty-five dollars. Their most expensive items (about a hundred dollars) are their Alloy MX series racing pants. These pants are made from a polyester blend that's very breathable. Not only are they comfortable, they're protective! Their durability can protect you from cuts and scrapes if you have an accident. If you want to ride safe, Alloy Motocross gear is definitely the way to go! So in the end it comes down to what you want. If you want to ride dangerously, go without. But, if you want to be safe, while still maintaining comfort, go with Alloy Motocross gear. One of the best new companies to make gear for racing closed its doors in March of 2006. Alloy Motocross Gear was available for three years and made an impact on the market but it couldn't overcome competitors that had years in the business, a bigger presence and most likely more cash to make it through the tough economic times. 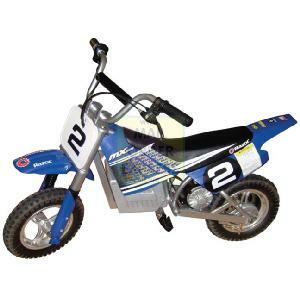 However, that doesn't mean that you can't find Alloy Motocross gear online. Often you'll find online stores that still have a few items and some used Alloy Motocross gear for sale items - on eBay and other sites. If you can find the gear available in your size, most likely you find that it fits your budget too. Many of the items are marked lower than the original price since the company is no longer viable. Don't let the low price fool you. This company made quality. They had different priced items to fit every budget and a variety of gear in all sizes. That meant there was something for everyone. The racing gloves were a particular favorite because they offered a better grip, so you had more control, and were light but extremely protective. The three series of gloves were the Clutch, the Atom and the Alloy MX. The original prices varied according to the series you purchased. The Clutch series, the most inexpensive of the Alloy Motocross gear, offered the gloves at around $25. The mid priced gear was the Atom, with the most expensive being the Alloy MX series. You could find the racing pants in the MX series for around $100. These prices should give you a good idea on what is fair pricing for used or new - but discontinued Alloy gear if you find the item online, should be a lot lower obviously. For those on a tight budget, this might be one way to save a few dollars and still get quality protective wear. Owning dirtbike gear or motocross gear is expensive. 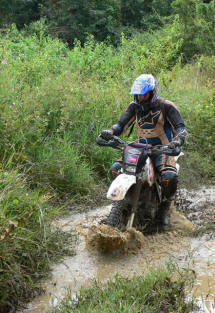 Many dirt bike gear brands are aimed at dirt bike gear for youth enthusiasts. The colourful dirt bike racing gear should be stored in a dirt bike gear bag after a race; so you don’t lose anything. Buy clothing with the latest motor bike "dirt" gear safety additions if you can. Padding inserts etc. should be checked over too – once you get home from the circuit, and don’t let your mx clothing run on the ragged edge before replacing them; if rips begin to appear – then it’s time to look for a new set of combos.